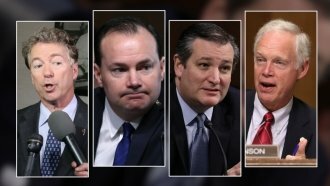 Several Republican senators plan to vote no on a motion to proceed to consider the health care bill if it isn't changed. Senate Republican leaders now face another obstacle in passing their health care bill. On Monday night, Republican Sen. Susan Collins said she would vote no on a motion to proceed with consideration of the bill. That vote is expected to take place Tuesday. And she's not the only Republican senator who plans to do so. Her colleagues Sens. Dean Heller and Rand Paul have also said they plan to oppose the procedural vote if changes aren't made to the bill. Late Monday, Sen. Ron Johnson told CNN he'd vote no on a procedural vote, too. Senate Republicans can only afford to lose two GOP votes to still move the bill forward and eventually pass it — and that's banking on a tie-breaking vote by Vice President Mike Pence. Republican Senators who have voiced concerns about the bill in its current form have done so for very different reasons. That makes Senate Republican leaders' jobs trying to gain more support even more difficult. Senators like Paul don't feel the bill goes far enough in actually repealing and replacing the Affordable Care Act. On the other end of the spectrum are senators including Collins and Heller. They represent states that expanded Medicaid under the Affordable Care Act, and they don't want to see cuts made to those provisions. Collins' announcement came just hours after the Congressional Budget Office released its report on the bill. The proposed Senate bill would reduce the federal deficit by $321 billion by 2026. It would also leave an additional 22 million people uninsured in 2026. The White House said in a statement: "The CBO has consistently proven it cannot accurately predict how healthcare legislation will impact insurance coverage." The statement went on to say that the CBO's "history of inaccuracy, as demonstrated by its flawed report on coverage, premiums, and predicted deficit arising out of Obamacare, reminds us that its analysis must not be trusted blindly." As they did last week, Senate Democrats decided to hold the floor late into the night Monday to speak against the health care bill.